Although part of the FERLD has not burned since 1760, it has been affected by other disturbances, including timber harvesting and, more importantly, several spruce budworm (Choristoneura fumiferana) outbreaks. Three outbreaks, occurring at intervals of 25 to 30 years, have occurred in this area during the twentieth century (Morin et al., 1993). Spruce budworm larvae feed on the young needles of balsam fir and spruce, although balsam fir is by far the most vulnerable species. The vast majority of mature fir trees in the area were killed during the most recent epidemic, which lasted from 1970 to 1987 and its still possible to see many standing dead trees (fig. 1; Bergeron et al., 1995). Fir mortality varies greatly from one stand type to another, with coniferous stands being more affected than hardwood or mixed stands. Fig. 1. 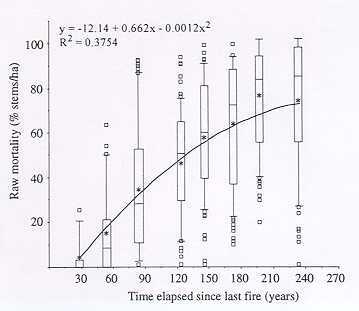 Raw mortality of balsam fir in relation to the time elapsed since the last fire from which the stands originated. Box plots portray the median (midbar in the box) and the 10th, 25th, 75th and 90th percentiles. Asterisks show the mean values. 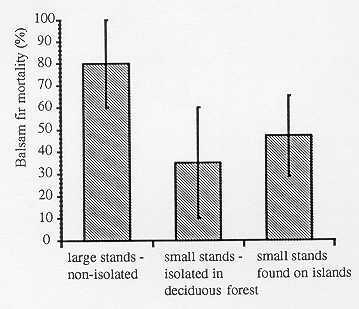 Nonetheless, it is possible to observe greatly reduced levels of defoliation and mortality in small coniferous islands (fig 2). Although no data exist concerning local spruce budworm abundance during the last oubreak, current population densities do not appear to be linked to a stands ecological location (site type). As well, isolated stands do not avoid budworm damage because of their distance from continuous coniferous stands. Rather, the rate of budworm parisitism has been found to be significantly higher in isolated softwood stands surrounded by hardwoods (Cappuccino et al, 1998). Budworm mortality during larval development may therefore result in reduced defoliation levels and lower tree mortality in these situations. Gaps created by spruce budworm outbreaks may cover large areas, depending on the abundance of balsam fir in the stand. Fir seedlings are only rarely affected by the budworm and are generally the most abundant species in the regeneration layer. As a result, they will usually replace the dead overstory fir and form the next stand. However, the presence of extremely large gaps, as found in older coniferous stands, may result in a decrease in fir density, to the advantage of other species such as aspen, cedar and shrubs. Fig. 2. Comparison of balsam fir mortality (%) occuring in three different spatial contexts.